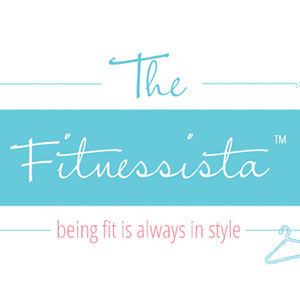 Hi Fitnessista readers! 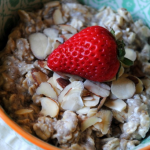 My name is Jenn and I blog over at Eating Bender. I’ve been lucky enough to know Gina for more than four years now and am so excited to be guest blogging while she is soaking up the California sun. If I could sum up my fitness philosophy in one word, it would be variety. I’d like to think that Tony Horton, Shaun T. and I are best friends (though I would blush if they saw the videos in those two links). Once a year, my husband Bobby and I scale the John Hancock building in Chicago. We even hiked the Grand Canyon for our first anniversary. I’m always up for trying something new, but one of my most recent fitness endeavors – and perhaps the one that I am most proud of – was crossing the finish line of the North Shore Half Marathon. I’m proud because for much of the race, I wasn’t sure finishing was going to happen. To make a long – and painful – story short, about two weeks away from race day, I began to have trouble with my IT band on long runs. 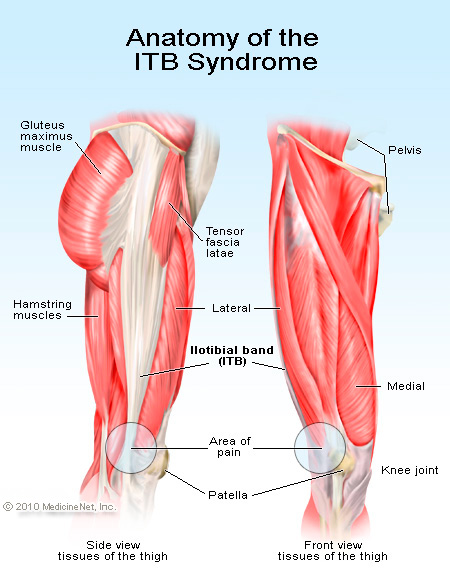 Illotibial band syndrome (ITBS for short) is “an overuse injury of the tissues located on the outer part of thigh and knee.” It’s very common in runners, especially when training for long distances. When I first began feeling the pain, I tried to ignore it. A beginner’s mistake, I know, but I had set a goal of completing the half marathon in less than two hours and was determined to see it through. 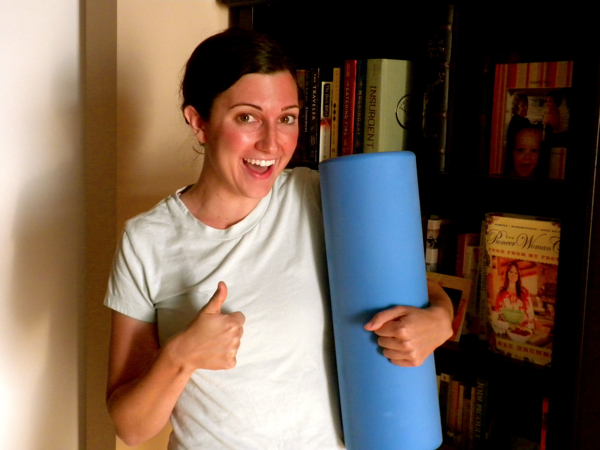 At the advice of my fellow bloggers and running buddies, I began doing more stretching after long runs, and ultimately purchased a foam roller and compression wrap. I thought I would somehow power through on race day, but my body had other plans. 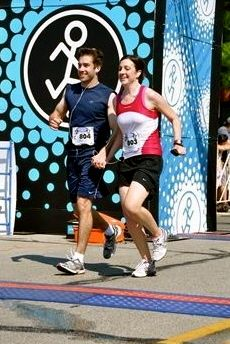 Through the support of my husband, a little willpower and a lot of stubbornness, I still managed to complete the race with a combination of jogging and walking, crossing the finish line at 2:23:48. Earning the medal was immensely rewarding, but the days that followed the race were tough. I could barely move, much less walk, without pain. I hadn’t pushed myself past my limit quite yet, but I had toed the line and I knew I owed it to myself to take it easy. And so the question became…what comes next? First things first: Tony Horton and Shaun T. have been replaced with a new best friend. 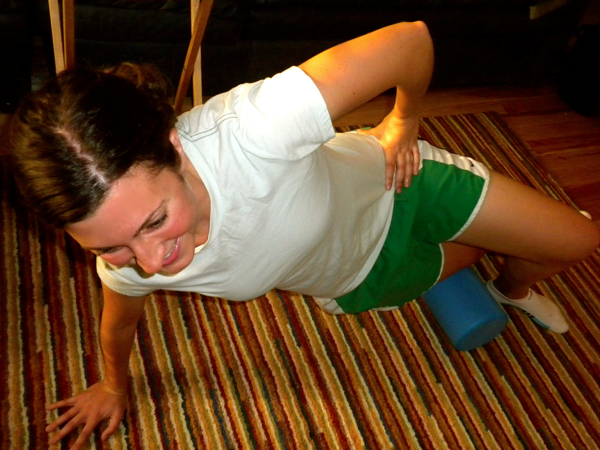 My foam roller and I have a love-hate relationship, but it is by far the best way to loosen up the knots in my legs. One of my favorite exercises is specifically designed for the IT band. You place the roller on the outside of your thigh and support yourself using the arm on the same side of your body and the opposite leg. Once you’re set, just roll back and forth at least 10 times per side, breathing as evenly as possible. If it hurts, that likely means you’re doing it right. Tensing up will make the pain worse, so stay as relaxed as possible. That said, screaming is optional but encouraged. You can continue moving up your leg to reach the entire length of the IT band, and should start to feel relief in the hours that follow. I now try to do this stretch at least twice per day. It may not actually be ITBS. As much as I wanted to diagnose my pain, research has shown that up to 80-90 percent of runners actually suffer from weak hip stabilizing muscles instead. Translation: I need to work on strengthening my legs. Running is great exercise, but it can only work the areas that are engaged while – you guessed it – running. Sounds obvious, but I just assumed if I was exercising, it was enough. I’ve now begun to incorporate moves such as squats, jumps and hip abductors to regain strength. Ice is nice. In the days following the race, I iced my knee as often as possible and gave the entire area a self-massage while it was numb from the cold. There are a lot of instructional YouTube videos out there on the best ways to go about doing this. Cut yourself some slack. I run because I enjoy running, so it was hard for me to imagine going without it once the race was over. But I’m 25 years old. When I think about how I want to feel 25 years from now, it does not include knee surgery or other complications as a result of overuse. I am grateful every day I have the ability to exercise, but I have also learned not to take it for granted. There are plenty of other ways to work up a sweat until I feel confident enough to pound the pavement again. Although I continue to learn more about ITBS and how to prevent it, I am still very new to the area of running injuries. I would love to hear from anyone who has either gone through or is currently experiencing some of the same issues. Thanks so much for reading – and cheers to crossing many more finish lines, no matter what type of “race” you’re training for. Thank you for your wonderful post! 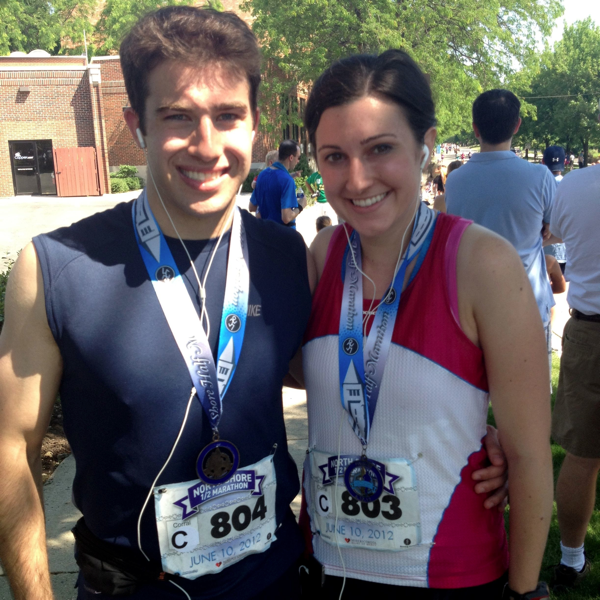 I ran my first Half Marathon in April, and it was a constant challenge. Right after I started training I developed plantar fasciitis and had to stop running for about 4 weeks. It took a lot of determination and willpower to start training again and prepare for the race. In the end, I finished the race and felt amazing! But, once the race was over, I stopped running completely for about 2 months. I gave my body a chance to heal completely and now I’m slowly picking up running again. I’m glad I took the time off because I don’t want to spend my life fighting injuries because I was too stubborn to take time off. Thank you, Rachel – for the kind words and for sharing your story! The last line of your comment especially resonated with me. I couldn’t agree more – and although I can be very stubborn (and am not to stubborn to admit it, haha), I know that this whole process of healing will be beneficial to both of us long term! Wonderful post- and congratulations on finishing your half marathon! You are right in saying that taking a break is sometimes needed- our bodies are not machines! We believe in training well, and treating your body with respect- it seems like you are doing both of these. Keep up the great work! Thank you so much! It’s all about finding the balance between challenging yourself and knowing where your limits are, right? I appreciate the kind words! I have never had ITBS, but I’ve stress fractured my feet and back and had numerous other less serious over use injuries. Definitely good to listen to your body, cross train and avoid exercise that aggravates your injury so it can heal. Strength training, stretching and foam rolling will all help. Possibly try to do a few sessions with either a physical therapist or a trainer who might be able to diagnose muscle imbalance. Great post! Thanks, Jess! I’ve definitely considered looking into a few PT or training sessions in order to make sure I am on the right track. I appreciate the words of support and look forward to checking out your blog! Congrats on completing the half marathon! And thanks for your tips in this post. 🙂 I just started foam rolling this year, although I don’t do it as much as I should because I have no attention span haha.